As some of you already know, during my senior year of high school I took College Board's daunting year long AP Studio Art course, and I barely survived. Fortunately, I did manage to force out a pretty interesting concentration in the process. If you don't know, a concentration is a body of work all relating to a specific medium and concept. 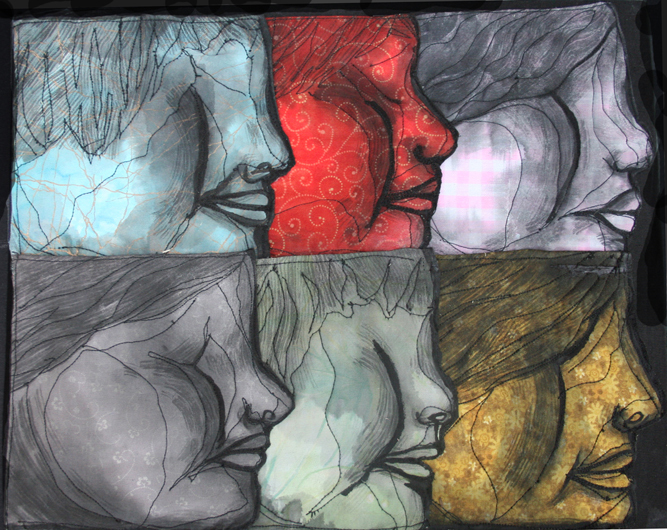 The Studio Art portfolio requires you submit a concentration as a part of your portfolio. I knew that it was supposed to have some sort of profound concept to go along with it, but honestly I started this series with just an intense urge to work with a material I had hardly used before- fabric. I don't know exactly why I gravitated so strongly towards this medium, but something about the perceived "permanence" of the textiles was very appealing to me. Using fabric is different than drawing on regular paper. Its much more durable and forgiving at times..you can do a lot of different things to fabric to change it's appearance without the fear of it falling apart. It also opened me up to an exciting variety of colors, patterns and textures, and a new way to approach creating a cohesive image. Still, I used many of my "traditional" art skills while experimenting with this new unknown. I manually painted in the details of many of the works that were further embellished with stitch work and applique. On some pieces I even used a few oil pastels, which had a great effect on even the loudest of patterns. Speaking of using traditional techniques, all of the subjects in this concentration were done directly from life observation. 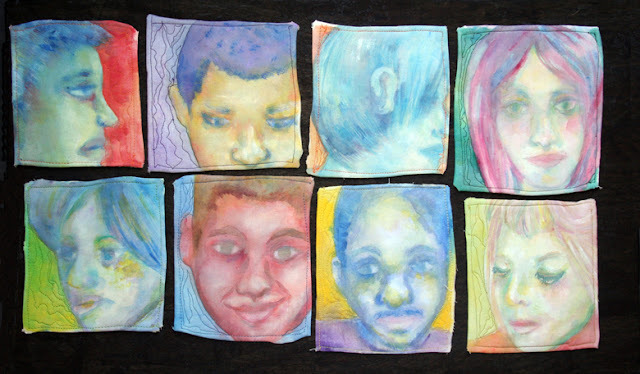 Yes, I was a crazy person that forced people to pose for me while I hastily sketched them on a tiny scrap of fabric. I drew peers, strangers, friends, or anyone that held still long enough for me to copy them down. 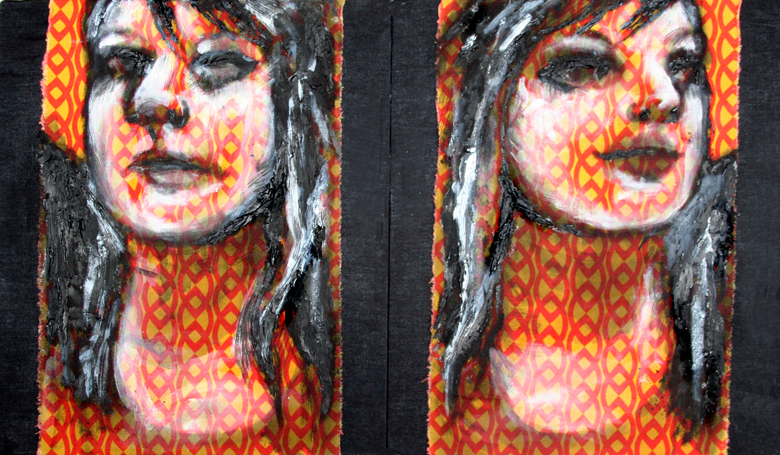 "Ten and a half Chins" acrylic paint and scraps of textile. Machine stitched. "Eight your Face" Acrylics on textile. Machine stitched. "The Mirror" The only piece that didn't include sewing. Modeling paste, gesso and acrylics on textile. "Seis Face" One of my favorites of my concentration. India ink and acrylics on textile scraps. Machine stitched. 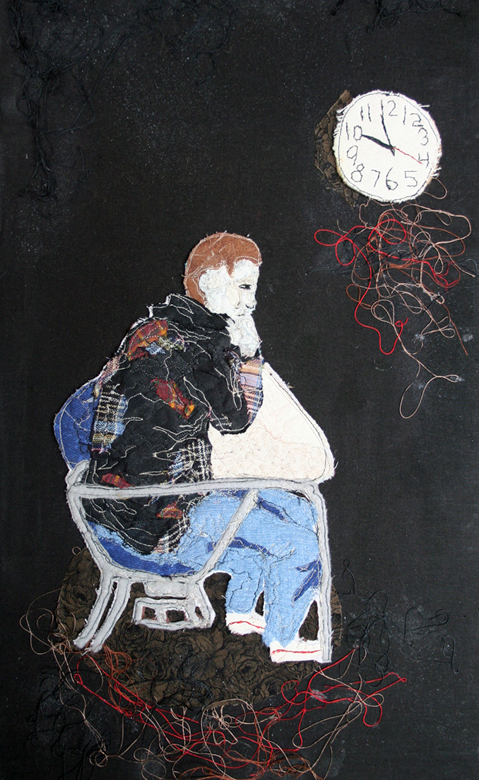 "The Waiting Clock" Textiles and thread. 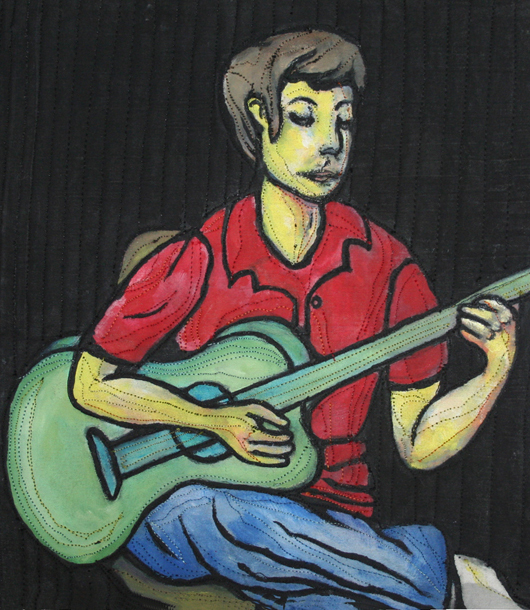 "A Guitar Man"Acrylics on textile. 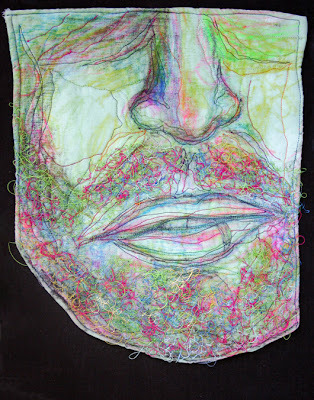 "John's Silk Beard" Oil pastel on textile and (silk) thread. 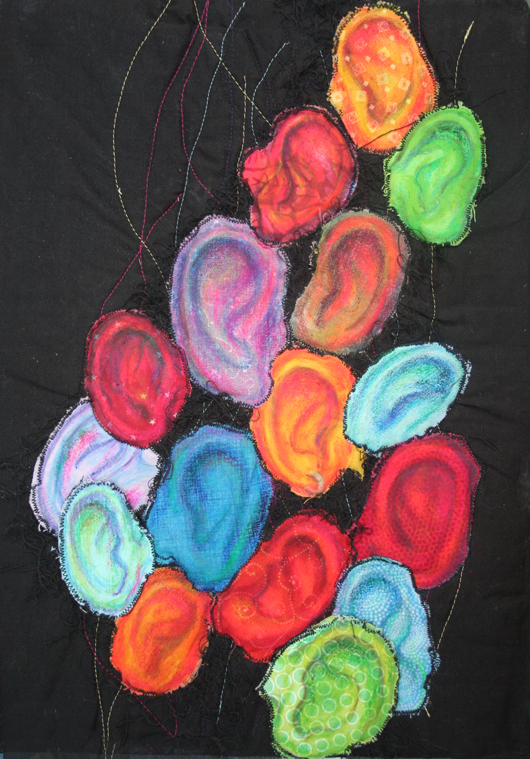 "Lend Me Your Ears" Oil pastel on textile scraps. I discovered the concept behind my concentration after I had nearly completed it. After I put all the images together at once, I realized that I had created something that sort of resembled a quilt. This was eerily appropriate because life itself is kind of like a quilt. It has blunt patterns and repetition, but it also has vibrant colors and intricate details subtly sewn in with the threads of time. Tiny pieces taken from here and there all add up to one big picture. I like that. The originals are not currently for sale, but high resolution 8 1/2" x 11" prints are now available. Contact me for more info. love love love all of these...i might paint today cause of you..or finish what i have already started...hope all is well on your side.always thinking of you dear friend. you inspire the world with your work. Wow! 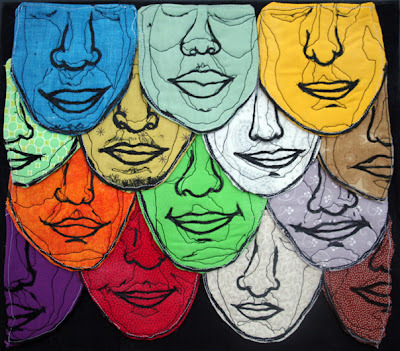 Cool textile work. Like it massively. I agree with the above comment: you do inspire the word with your work. It has inspired me. Thanks!